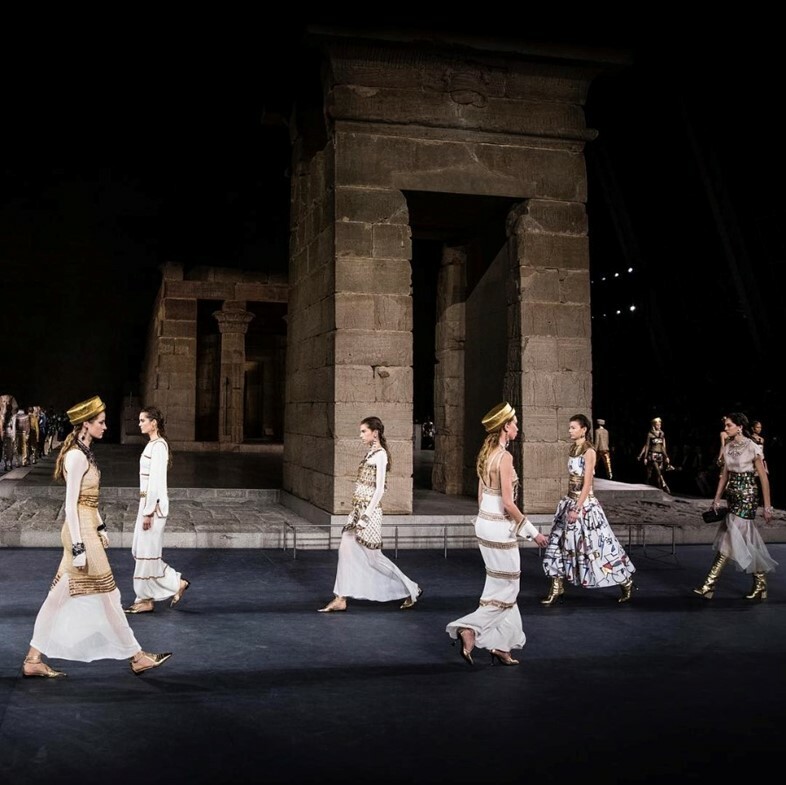 Karl Lagerfeld might be known for creating vast recreations of world landmarks as backdrops for his Chanel collections, but last night he had the real thing: the remains of an Egpytian temple from 10BC. 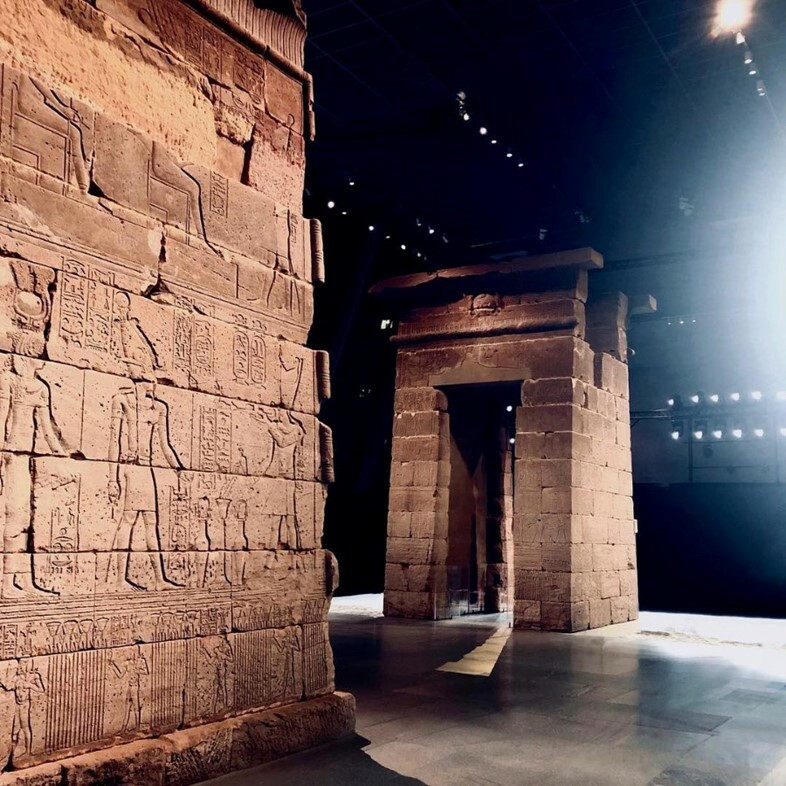 Staged in the Sackler Wing of the Metropolitan Museum of Art, models walked among the towering Temple of Dendur, bequeathed to the museum by the Egyptian government in 1963 for their help in saving several artefacts threatened by building of the Aswan Dam. 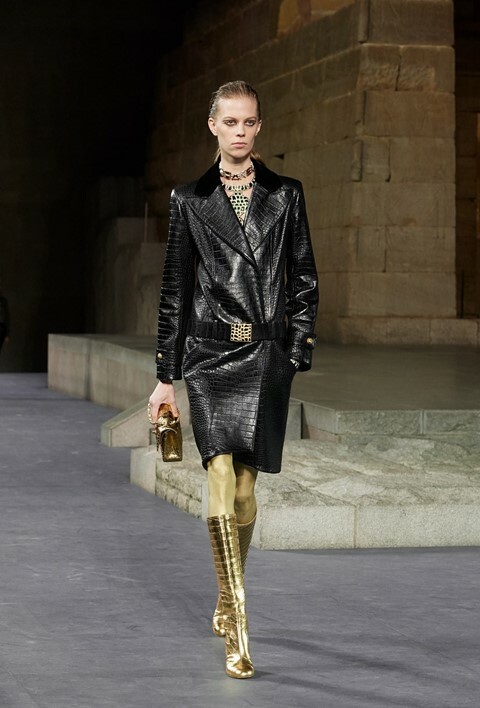 Lagerfeld did not leave the monument without his own flourish, though – guests were greeted by a moat of papyrus, planted especially for the occasion. Befitting the setting, Lagerfeld evoked the grandeur of Ancient Egypt’s royal dynasties: crossover tweed skirts recalled the kilt-like shape of the shendyt, worn by Egyptian deities, Chanel-branded scarab beetles were dotted throughout and ornamental collars on heavy-shouldered tweed suiting were in the spirit of the civilisations’s final ruler, Cleopatra. (Gold, meanwhile, was the royal hue which ran throughout.) But the collection also recalled it’s more prescient setting – New York itself – with deco-style detailing and simple column-shaped silhouette inspired by the city’s 1930s-built skyscrapers. 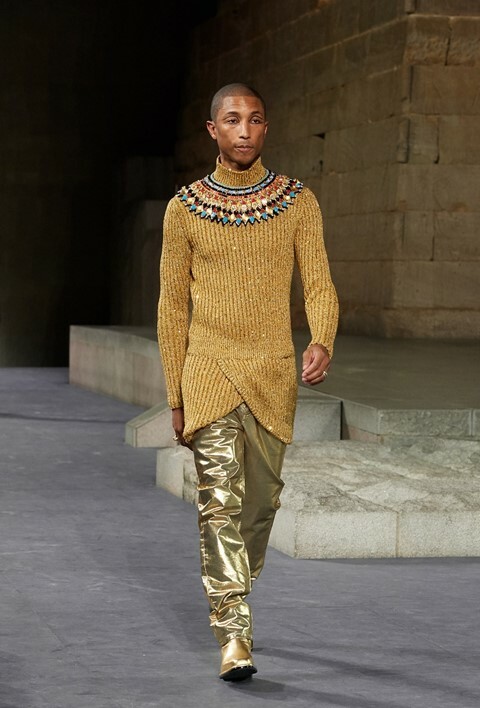 There were several familiar faces on the runway, not least Pharrell Williams – star of Chanel’s Gabrielle fragrance campaign film – who chanelled his inner Tutankhamun in top-to-toe gold (and requisite kohl-lined eyes). Elsewhere Chanel regulars Kaia Gerber, Binx Walton, Autumn/Winter 2016’s AnOther cover star Vittoria Ceretti and Autumn/Winter 2018’s couture bride Adut Akech all walked, though Lagerfeld chose to take his final bow alongside Hudson Kroenig, the designer’s godson (and son of model Brad Kroenig) who wore a Chanel-branded sweatshirt and knee-high gold leather boots for the occasion. 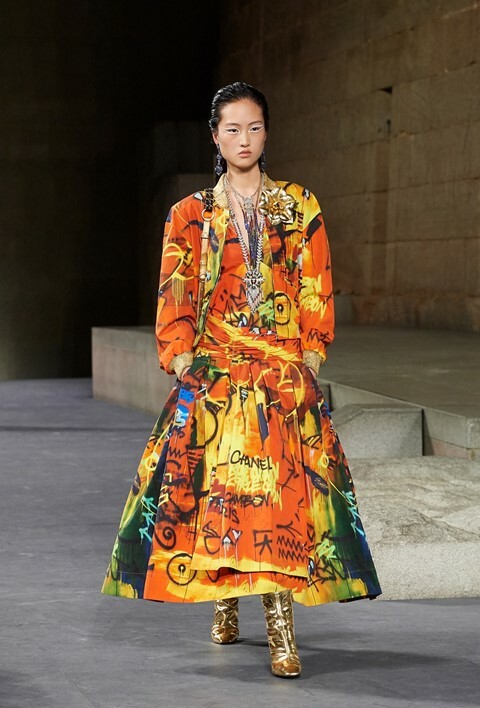 A nod to the New York City’s street life came via a spraypainted graffiti motif, albeit courtesy of French contemporary artist Cyril Kongo, known for his energetic street art-inspired paintings. Emblazoned across traditional Chanel two-pieces, boots and gowns, the double-C monogram, alongside outlines of flowers, zig-zags and owls, it was a contemporary response to the ancient hieroglyph. This was, after all, Chanel’s Metiers d’Art show, which celebrates the 26 ateliers which work with Chanel – from the Desrues button makers to the famed Lemarié and Lesage embroiderers, here providing the intricate bead- and featherwork which adorned several of the pieces. Notable, too, were the evocations of exotic skins – which Chanel announced on Monday they will cease to use, alongside fur, in their collections. Here, crocodile skin was ‘mock croc’, while lizard was conjured with vegan pineapple leather.